Dr. Magda Havas alleges that WiFi can cause serious health effects such as heart irregularities in susceptible individuals. She has been extremely active in campaigns across Canada to have WiFi removed from schools. The following is a challenge that has been issued to Dr. Havas for independent replication of her claim that WiFi can cause heart irregularities. One of her prime references is Mr. Martin Weatheral, who claims that WiFi causes him to experience serious heart irregularities. He was featured along with Dr. Havas on the Global TV program 16:9. He and Dr. Havas "demonstrated" the alleged effect of WiFi on his heart in a segment of this program. Mr. Weatherall wrote an email (see below) to one of our correspondents in which he said that he was living proof that EMF causes serious health effects. We decided to take up this challenge. I have teamed up with Dr. Joe Schwarcz the Director of McGill's Office of Science and Society, and Dr. David Langleben the head of cardiology at the esteemed Montreal Jewish General Hospital to conduct an independent double blind test. I have sent the attached letter to Mr. Weatherall and Dr. Havas as well as to the producers of the program 16:9. I have included the initial response we have received from Magda Havas as well as the reply by Dr. Joe Schwarcz as well as all subsequent exchanges. It is interesting to note that Dr Havas has flatly refused to accept our challenge. Instead, she has chosen to make wild and totally false allegations of some sort of "conspiracy" designed to protect my alleged personal interests. This is a clear indication that she is afraid that her heart rate "study" will be shown to be fatally flawed and that she has no credible scientific evidence that WiFi can cause health effects. You may have a Ph.D, but you are an ignorant fool on the health effects of pulsed microwave electro magnetic radiation. You have chosen to ignore the masses of scientific evidence, showing significant biological effects, provided in the Bio Initiative Report (www.bioinitiative.org <http://www.bioinitiative.org>). You are ignoring the most significant health and environmental threat in modern history, exposure to electro magnetic radiation. Some information is attached. The WEEP Initiative is a not for profit organization which refuses advertising revenue. Blind testing by Prof. Magda Havas of Trent University, has shown that during blind testing my heart rate doubles when exposed to a Wi Fi router or a cordless phone. Since smart meters were installed in my neighbourhood I have suffered tachycardia and arrhythmias. I have also suffered many other adverse health effects when exposed to electro magnetic radiation. I do not need idiots like yourself, telling people that I do not suffer. 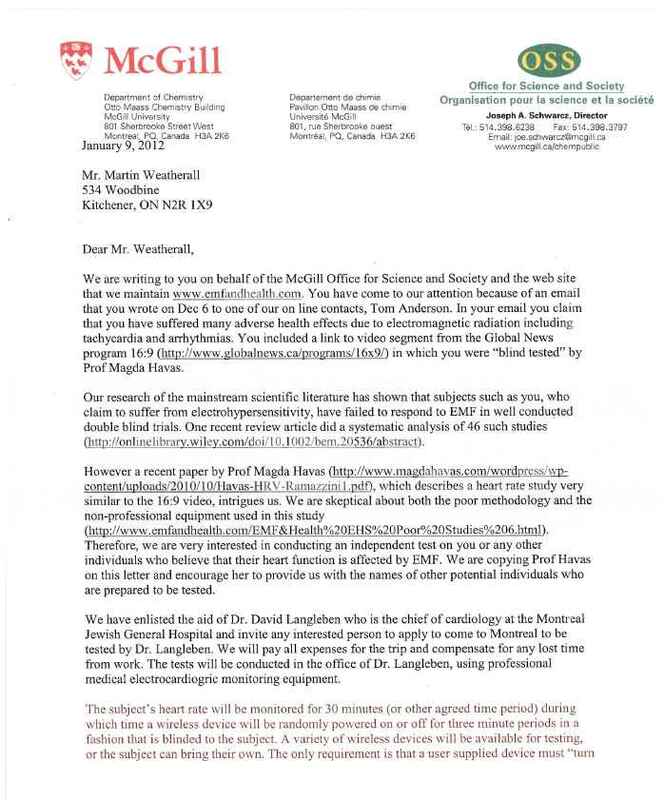 Please find attached a copy of an open letter that I sent to you and Dr. Magda Havas via FedEx yesterday. This letter is in reply to your email of Dec. 6 to Tom Anderson (below). The letter is pretty much self explanatory. Dr. Havas claims that the heart rate of you and others like you is affected by WiFi and other forms of EMF. We have made arrangements to conduct an independent double blind trial with Dr. David Langleben, one of Canada's leading cardiologists. We intend to send copies of this letter to the producers of the 16:9 program in which you appear, and to others who have an interest in this issue. We are skeptical about the validity of the tests that Dr. Havas has conducted since they are contrary to the findings of mainstream science. I have attached a review article of 46 double blind studies and a Fact Sheet from the World Health Organization. However, the wide publicity on this issue has raised public concerns. The gold standard in science is independent replication. It is for this reason that we are inviting you and any other self professed electrosensitive person to collaborate with us on our independent double blind trial. We think it would be of great benefit to you and to all those interested in this issue for independent tests to be conducted. This will help establish whether the symptoms experienced by you and others like you are actually caused by EMF. I appreciate that you would like to repeat the heart rate variability study we published in 2010 and you are welcome to do so. However, you should know that the original study was based on 25 subjects in Colorado and we have since tested an additional 75 subjects from various states and provinces and are in the process of analyzing the data. Replicating your own research is an important part of the scientific processes, which is what we are doing. So far we are conducting science properly. We designed a double-blind study with randomized sham exposures and had it published as a peer-reviewed publication. We have also tested for possible interference and found none. The only thing the radiation interferes with is the heart. Furthermore, a group of European scientists are independently replicating our study. You are most welcome to do the same. Anyone is able to replicate a scientific study and that is how we progress in science. This type of replication is particularly important when the findings have such enormous consequences and when the results are contrary to what some might expect. Indeed this may very well be an example of the paradigm shift that the Philosopher of Science, Dr. Thomas Kuhn, has written about. This paradigm shift often accompanies a major advancement in our understanding of science. The major advancement in this case is over turning the assumption that radio frequency radiation at levels below federal guidelines is safe and that one effect is on the heart and the autonomic nervous system (which are bioelectromagnetic in nature). However, you must know that I suspect your motives as you have written harshly about anyone who finds anything documenting adviser health effects following exposure to microwave radiation. Instead of following the normal scientific route, which would be to submit a letter to the editor of the journal expressing your concerns, you have simply provided, what I would call "misinformation" on your website. You have made false statements about my research on dirty electricity and now you are doing it again with my research on heart rate variability. Also, I suspect that you are trying to protect yourself from possible legal action as you have provided McGill university with wireless technology and do not want to be blamed for adverse health effects that may result from that exposure. It is in your best interest and in the best interest of your company, Matrox, to find that radio frequency radiation is not harmful to human health. The same was true for CEOs in the cigarette industry. Indeed you have taken great steps to share your views with the world by funding Dr. Joe Schwarcz at McGill's Office for Science and Society to "educate the public about quackery" and to "battle against charlatans." According to Wikipedia, your contribution ($5.5 million) is believed to be the largest single gift for "science promotion" in Canada. If you were truly funding science promotion, I would applaud your efforts. I see it as something quite different. Unfortunately, what is happening is that corporations are providing funding to universities and interfering with their ability to remain unbiased and independent. "Do not bite the hand that feeds you" is one way of looking at this. This is not just about doing proper science, nor is it about scientific quackery. This is a much larger issue and that is the independence of university research and inquiry in the wake of industry funding. It is not often that I'm left speechless....but your response to Lorne Trottier's invitation to cooperate with us on electrosensitivity research almost accomplished that. But I think I can find a few words. 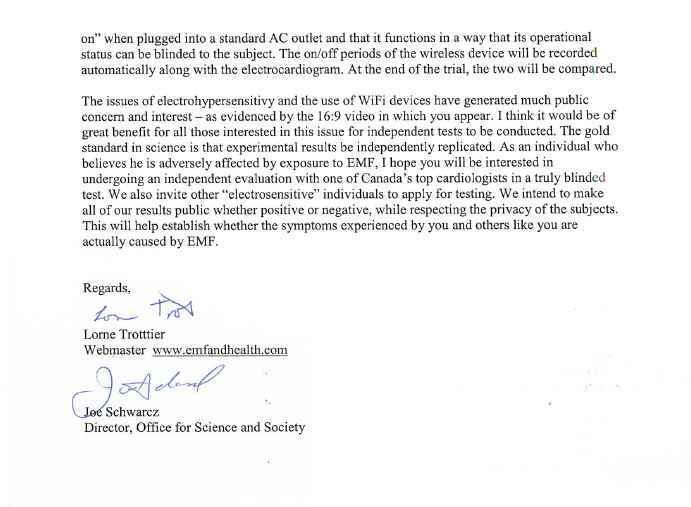 The allegation that Lorne's interest in electrosensitivity stems from his company's concern that the wireless equipment it provided McGill may be responsible for adverse health effects is simply absurd. An implied comparison to CEOs in the cigarette industry borders on slander. Matrox, Lorne's company, does not manufacture wireless equipment and has never provided McGill with anything. For this, you owe him an apology. Lorne Trottier is a remarkable man who has a passion for science done right. Period. That is why both he and I would like to follow up on your studies about the relationship between electromagnetic radiation and health. As has been expressed, we question some aspects of the methodology and would like to set up an independent, unbiased, properly controlled trial, as we described in our letter. Obviously, rather than testing random volunteers, we would like to test the subjects you claim to have identified as suffering from this condition. Their expenses for travel to Montreal will be covered and financial compensation for their time will be provided. We invite you to come to Montreal as well and ensure that the trial is run to your satisfaction. All your expenses will be generously covered. The trial will be double-blind, designed and monitored by Dr. David Langleben, head of cardiology at Montreal's Jewish General Hospital. Should the trial confirm your findings, we will publicize the results widely. Our sole intent is to identify and disseminate reliable scientific information. We are quite prepared to lend support to your cause should the trial's results so indicate. We will also provide funding for any cardiologist you would like to invite to monitor the proceedings. You can supply your own RF measurement device, and Wi Fi transmitter. All we will do is ensure that the subject and cardiologist(s) in the test room are blinded to the EMF. We will use a professional electrocardiogram to measure the heart rate - not the amateur device you have described, which we have already purchased and tested. The "Nerve Express" heart rate monitor produces all kinds of artifacts and is not reliable. Surely if subjects such as Mr. Weatherall have clear and direct reactions to EMF, as your published data suggest, there should be no problem reproducing the results in our cooperative trial. I am compelled to comment further on your unfounded allegations about Lorne's motives. Some simple Google searches will confirm that Lorne Trottier is one of Canada's major philanthropists. In addition to his gifts to McGill, he has also made major gifts to local hospitals as well as to environmental and science outreach organizations such as the David Suzuki Foundation and the Montreal Science Centre. He regularly supports Combined Jewish Appeal, Sun Youth, Red Cross, Save the Children and UNICEF. I think it is quite apparent that Lorne Trottier's philanthropy is motivated by his passion for science and by a desire to improve the welfare of the public. To impugn that he has ulterior motives is misguided, to say the least. And if your true motive is to further science, you will accept our offer to confirm your results. We are set to provide national publicity both for our suggested cooperation and for the results of our experiments. Whatever the outcome, science stands to benefit. We are looking forward to your suggestions about time frame so that we can issue a press release.